Come to play or come to relax in this wonderful cedar shake style cabin with knotty pine interior finish and Douglas Fir floors. 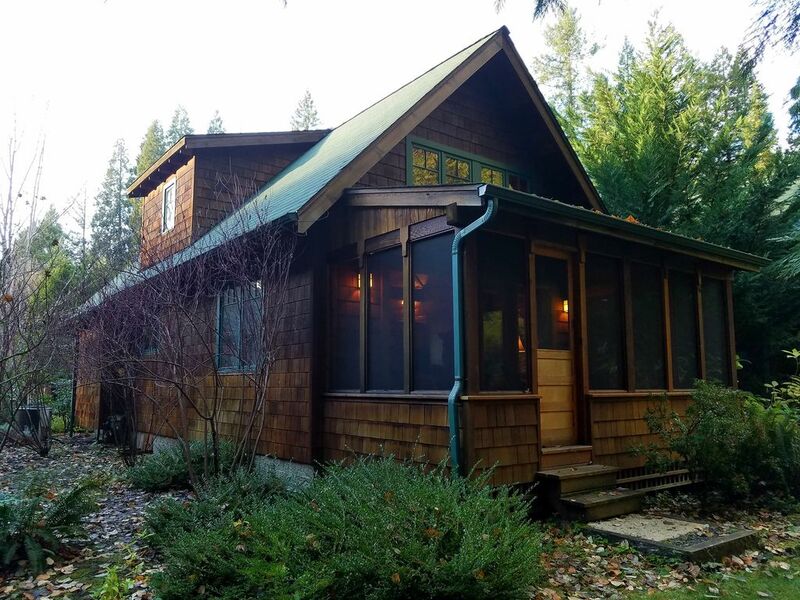 All of the comforts of home nestled within a pristine environment of manicured flower gardens and lawn along the north bank of the Mckenzie River. Fish the river just feet from the screened in porch. Golf at the famous Tokatee Golf Club, just 3 miles west. Hike or bike the Mckenzie River Trail, starting just about a mile east of the cabin. Waterski or jet ski on beautiful Cougar Reservoir or Blue River Reservoir, just minutes away. Rent a small fishing boat for a day on Clear Lake. See the famous "Blue Pool", just upriver about 20 minutes. Drift boat down the Mckenzie and fish for native cutthroat trout or enjoy the bounty of a steelhead fishing day. Kayak or white water raft the rapids. Explore the lava flows of Belknap Crater or hike up to Castle Rock and view the entire Upper Mckenzie River Valley and Cascade mountain range. Soak in the natural hot springs at Deer Creek or Cougar Reservoiror. Soak and swim in a hot water pool, just minutes close. When you're done with adventures and just want to relax, the cabin offers comfortable furnishings, new beds, a fully furnished kitchen, central heat and air conditioning, private WI-FI, satellite TV, and a generous screened in porch overlooking the river. There is a beautifully kept lawn area between the cabin porch and the river with decorative benches and places to relax on the river bank. The floral gardens surrounding the cabin and around the common grounds are perfectly kept lending to a sense that you're definitely in another world. We're the managers. Our owner clients rely upon us to deliver an excellent vacation experience to you - and we're proud to say that we've been doing exactly that for over 10 years now. Our cabins are well equipped and very clean! Our locations are the best available in the area. Our commitment is to deliver the experience that will keep you coming back year after year. Give us a chance to earn your return business. This cabin is a picture of beauty inside with knotty yellow Georgia pine finish throughout, contrasted slightly by flawless Douglas fir floors. The gas fireplace and pristine natural surroundings exude the ambiance of "vacation" and the location is central to all of our local adventure options. Need a latte? Want a drink? Hungry? There's a great little place to satisfy your need right on the property: The Mckenzie Station offers specialty coffees, lunch and dinner options and a cozy little lounge, just 100 feet from the cabin, literally. Full bath downstairs with tub/shower. Full bath upstairs with shower. This cabin sits right on the north bank of the Mckenzie River. Great river views and that constant roar of the water. Great fishing and wonderful common grounds all along the private River access. Great adventure getaway for couples or families. Perfect for a romantic getaway with your favorite person. Two couples could share for a golfing excursion. We loved the location and log cabin with quality materials. Overall it was very clean, nicely decorated, kitchen was well supplied, beds and furniture were comfortable. We were very disappointed that “the community had run out of propane” so we couldn’t have a fire in the fireplace, an amenity that weighed heavily in our decision to stay there. We also found nearly all the towels, kitchen & bath, were pungently sour. Dana, we are so sorry about the propane outage! That was very strange. The HOA had just purchased a full tank a few months back and it usually lasts quite a while longer. The HOA has since set up a more frequent filling schedule with the provider. We sanitized the washer, and will look into a less pungent softner. We surely hope you'll give us another chance. You might have noticed that all prior reviews have been stellar! This cabin is a great place to stay. It's beautiful and in a great location. We stayed in the middle of winter. There's a restaurant and a fully stocked store within steps. Natural hot springs, waterfalls and Hoodoo ski park all just up the highway. The river is right outside the back door. Can't wait to come back again for a summer vacation! Thanks Dana! We sure did enjoy hosting your family! Amazing stay! Loved the experience. It was a cozy and a beautiful cabin. Not much wasn't provided other than our clothes. Lovely wood interior, so beautiful and cozy - loved the fireplace. Screened in porch gives respite from the rain but still allows enjoyment of the rushing river... would definitely want to stay here again!! We always love staying in these cabins. The owners are very thorough & helpful when needed. The cabins always have well stocked utensils. Tons of movies were available to watch in the cabin we had this year. Close to great hikes & love the general store so close across the street. It’s just our favorite quiet, recharging getaway. We’ll be back again next year! We enjoyed our stay - cozy, very clean, nice kitchen.